I just have to share the beautiful insect I found this morning on my hollyhocks. Look at the rainbow colors in her wings and her shiny golden eyes. She is so delicate and ethereal. 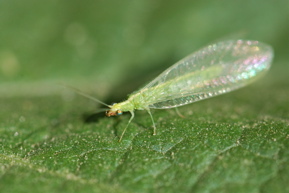 The lacewing is one of the many insects considered to be beneficial that you may find in your yard. Her larvae feed on other insects such as aphids, whiteflies and lacebugs. The larvae are like tiny alligators with curved jaws sticking out in front. If I find one, I'll try to get a picture to add here.